Did you know that pure sugar is better than sticky caramel(WHAT?! ), and dark chocolate is always a winner. Everything in moderation is typically okay and of course brushing your teeth (or at least rinsing your mouth with water) after enjoying your Halloween candy is always a great idea! WORST: Taffy and candies filled with caramel, coconut, or nuts are the worst kinds of candy for teeth because they stick to everything inside of your mouth, including the grooves of your teeth. The longer a food sticks to your teeth, the longer bacteria can feed on it–which could produce cavity-causing acid. BEST: Sugar-free gum may be the best treat this Halloween season because it leaves no sticky residue, and it is sweetened with xylitol–a natural sugar the bacteria is unable to form plaque on(Source: parenting.com). 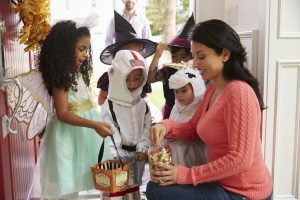 Because there is never a candy deficiency around Halloween, it is important to be aware of the lasting negative effects Halloween candy can have on your teeth. Excessive intake of these candy can lead to tooth decay, cavities, and loss of enamel. Be sure to always brush your teeth after eating candy to ensure no surprise visits at the dentist! Nobody wants to see the dentist pull out that drill! Eek! Have a safe Halloween, everyone!